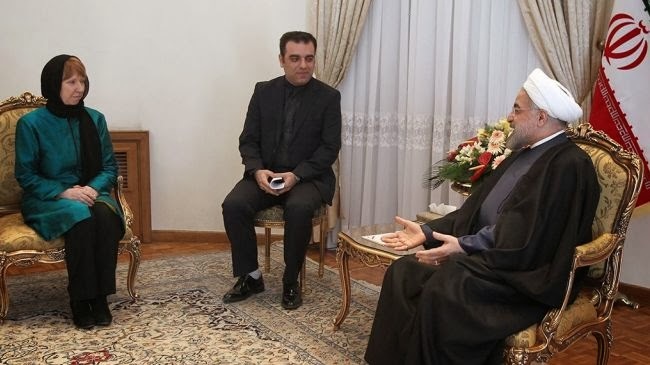 EU foreign policy chief Catherine Ashton met with Iranian President Hassan Rouhani today and discussed the ongoing nuclear talks between Iran and P5+1 and Iran-EU relations. “Iran and the European Union can hold talks and have cooperation on regional issues including the fight against terrorism and extremism, the issues of Afghanistan, Syria and Iraq and narcotics trafficking,” Rouhani added. IRNA reported that Ashton had said in the meeting that the EU acknowledges the important role of Iran in the region and is ready to develop more dynamic ties with the country. Ashton will held talks on Sunday with Iran’s Foreign Minister Javad Zarif, Majlis Speaker Ali Larijani, Senior Advisor to Supreme Leader Ali Akbar Velayati, and Secretary of the Supreme National Security Council (SNSC) Ali Shamkhani. 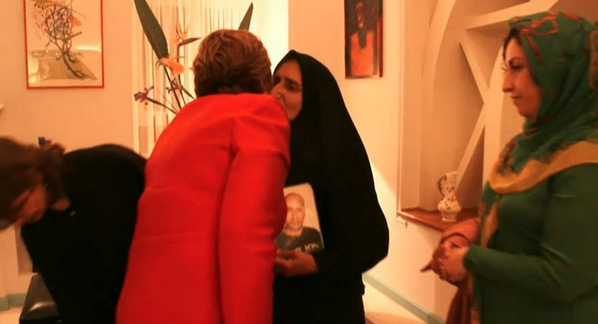 On Saturday evening, upon her arrival in Tehran, Ashton met with Iranian human rights activist Narguess Mohammadi and mother of Sattar Beheshti, whose son died in custody. One wonders how he got a PhD in England and still need and interpreter for his negotiations. Maybe he did all of his homework in Farsi then had someone translate it all into English...? why those People should use a translator. if we solve this Problem, everything else is solved. Well, Iran's biggest problem is that it is ruled by a bunch of thieving Islamist animals who have executed and raped countless thousands of its young men and women. "Negotiations" won't solve that problem. Do Putin and the "chinese leadership" claim to have earned a PhD in England? (Should I google that too)? Actually it is a Scottish University if we believe all the stuff. However, I agree that these guys are incredible in being "kodan". I mean who with the right mind will go and get a Ph.D. and still put that silly abba on? If these guys were a bit educated would behave like one. Even that Zarif guy despite being educated in US (as stated), he speaks with heavy Persian accent. When he greets a woman lkike Ashton he loks like an Indian guy with his hands in Bouda style. No wonder why so many people want to see the back of this bunch! Look most of these people are from bazari and lower classes. They don't have social polish. What do you expect!